The Volvo S80 is a fast, smooth and luxurious. It accelerates with authority and tracks straight as an arrow at high speeds. The S80 is at its best hurtling down the highway where it's a stable, comfortable platform. It's fast and handles winding roads well for a large luxury car. Inside is a sumptuous cabin with comfortable seats, sophisticated audio, and an available navigation system. The S80 is comparable in size to the Mercedes-Benz E-Class, Cadillac CTS, and Lexus GS and is a good alternative. 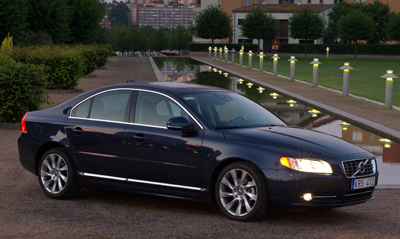 The 2012 Volvo S80 offers a choice between two six-cylinder engines. Both were fortified for 2011, and their new specifications carry over for 2012. The Volvo S80 3.2 comes with a 3.2-liter six-cylinder engine and front-wheel drive. Volvo says it can sprint from 0 to 60 mph in a respectable 7.4 seconds while the federal government says it gets 18/27 mpg City/Highway. The Volvo S80 T6 AWD comes with a 3.0-liter turbocharged inline-6 and all-wheel drive; with 300 horsepower and 325 pound-feet of torque it can reach 60 mph from a standstill in a very quick 6.3 seconds. The S80 T6 is EPA-rated at 16/24 mpg. Order the T6 Dynamic Package and you get a sport chassis with shorter and firmer springs, modified shock damping, firmer anti-roll bars and stiffer subframe bushings. Optional adaptive cruise control allows the driver to maintain set following distances with the cars ahead: the system will accelerate or slow the car as needed. The S80 is loaded with safety equipment, from its protective structure to its state-of-the-art active and passive safety features. For 2012, S80 introduces Sensus, a menu-driven system to control audio, navigation, and other functions. The Volvo difference is that all Sensus functions can be operated via buttons built into the steering wheel or located below the seven-inch color screen. Volvo's intent is to minimize distraction from the road while still allowing drivers to explore the high-tech features of the car and personalize them to suit their needs. Also new, 2012 Volvo S80 models offer City Safety, a system that uses a laser beam to monitor closing speed with cars ahead and, if the driver fails to respond, automatically brakes to lessen the severity of a collision. Other changes for 2012 include a redesigned dashboard and center console, new Classic Walnut Wood inlays, LED turn signals in the outside mirrors, new alloy wheel designs, a new trim-level lineup, and changes to some options and packages. The 2012 Volvo S80 3.2 comes with a 3.2-liter inline-6 and front-wheel drive. The S80 T6 AWD comes with a 3.0-liter turbocharged inline-6 and all-wheel drive. Both are available in base, Premier Plus, and Platinum trim. The Volvo S80 3.2 ($37,950) comes with dual-zone automatic climate control with pollen filter; AM/FM/6CD/MP3 160-watt audio with eight speakers, Sirius Satellite Radio, auxiliary input, and USB connection; Bluetooth telephone interface (which adds audio streaming for 2012); Volvo Sensus with 7-inch color display; real wood trim; leather seats; leather-wrapped tilt-and-telescope steering wheel with audio and cruise controls; leather-wrapped shift knob; eight-way power front seats with memory for the driver; split folding rear seat; power windows; central power locking (including the fuel filler door) with remote keyless entry; power trunk release; power heated outside mirrors with memory; auto-dimming inside mirror; outside temperature gauge; four reading lamps; two 12-volt outlets; and 225/50R17 tires on 17-inch alloy wheels. Options for the S80 3.2 include a power sunroof ($1,000) and 18-inch Fortuna wheels with 245/40R18 tires ($750). The S80 3.2 Premier Plus ($38,950) adds front and rear park assist, Homelink remote garage door opener, a compass integrated into the inside rear view mirror, and Volvo's Keyless Drive with Personal Car Communicator (PCC). The S80 3.2 Platinum ($41,650) adds an upgraded audio system with Dolby Pro Logic II Surround Sound, 12 premium speakers, and a 650-watt amp; voice-control navigation with map care, and a rear park-assist camera. The Volvo S80 T6 AWD ($41,950) is equipped similarly to the base-level 3.2, except that the sunroof is standard, as are 18-inch wheels, although these latter are a different design that Volvo calls Magni. The T6 AWD Premier Plus ($42,950) and T6 AWD Platinum ($45,650) add the same equipment as their 3.2-model analogs. Exclusive to the T6, and expanded for 2012, is the Dynamic Package ($1,500), which upgrades to the Sport Chassis, 18-inch Fortuna wheels, xenon headlamps with Active Light Bending, sport seats, and Sanded Silver aluminum interior inlays (instead of wood). Option packages include the Inscription Package ($2,300) with Sovereign Hide full soft leather seating surfaces, Classic Walnut Wood steering wheel, ventilated front seats, leather and Classic Walnut Wood gearshift lever, leather-covered dashboard and leather center armrest cover. The Climate Package ($1,000) upgrades to heated front and rear seats, heated windshield washer nozzles, high-pressure headlight washers, Rainsensor windshield wipers, and Interior Air Quality System (IAQS). Stand-alone options include Volvo's Personal Car Communicator with Keyless Drive ($550), dual xenon headlights with Active Bending Light ($800), and metallic paint ($550). T6 buyers can substitute 17-inch wheels for the standard 18-inch rims for no charge. Safety equipment on all S80 models is world-class, starting with the patented body structure and including ABS with a sophisticated hydraulic brake assist, dynamic stability control, traction control, dual-threshold front airbags, dual-chamber side airbags (with one chamber for the hips and one for the chest), side-curtain airbags, next-generation WHIPS rear-impact protection, tire pressure monitor, and front and rear fog lights. The City Safe system has been added for 2012. All-wheel drive enhances safety in adverse conditions. Volvo cites studies suggesting that up to 90 percent of all traffic accidents are caused by driver fatigue and/or distraction. Based on this finding, Volvo offers the Technology Package ($2,100), consisting of Adaptive Cruise Control with Queue Assist, Collision Warning with Full Auto Brake, Pedestrian Detection with Full Auto Brake, Distance Alert, Driver Alert Control, and Lane Departure Warning. Also optional is the blind-spot information system, or BLIS ($700), that senses vehicles in the right and left blind spots and delivers a warning if there's something there. These features are a good idea and we recommend them, along with front and rear park assist and the rearview camera that comes with the navigation system. The Volvo S80 is a handsome sedan with distinctive styling; though it's getting a bit long in the tooth, especially when viewed next to Volvo's smaller, but more recently restyled S60. The two models do maintain a family resemblance, especially in their semi-fastback profiles. The new-for 2012 wheels on the S80 3.2 are a 17-inch design Volvo calls Regor, featuring a very simple and sturdy-looking 16-spoke pattern. They are a no-cost option for the T6, also. The 2012 T6 comes with a new 18-inch wheel Volvo calls Magni: nine curved spokes seem to flow tangentially from the hub and expand as they reach the rim; a dizzying illusion of motion even when they're standing still. But the S80's premium wheel is still the racy-looking 18-inch Fortuna Diamond Cut, whose seven spokes have machined surfaces that play dramatically with reflected light; it's a stand-alone option for the 3.2, and comes with the Dynamic Package for the T6. The sumptuous surroundings in the S80 are amplified by the wonderfully comfortable seats and the generous front and rear legroom that helps to put the S80 squarely in the luxury class. The seats are available plain, heated, or heated and cooled. And Volvo offers a nice selection of leather colors, including two-tone combinations, some bold, others oh-so-subtle. The upper instrument panel has been completely redesigned for 2012 to accommodate the standard-equipment Sensus system, which manages the audio unit, navigation system (if equipped) and other functions, while displaying information on a seven-inch high-definition color monitor. While the old navigation system popped up out of the top of the dashboard, Sensus is housed in a fixed center binnacle that stands higher than the rest of the dash panel. Volvo says the screen is positioned high to make it easier for drivers to keep their eyes on the road. Pressing the My Car button in the center stack offers access to a range of settings for the City Safety, Collision Warning, Pedestrian Detection, Driver Alert System, and Active Cruise Control functions, plus, lighting, door mirrors, climate, central locking and audi. In fact, all Sensus functions can be operated via buttons on the steering wheel or located just below the screen. The remaining switches, controls and instruments follow traditional Volvo themes, but everything is contemporary. Volvo's watch dial instrument faces are standard on all S80 models. The freestanding center stack that connects the dashboard to the console is a key design element. It's been re-styled for 2012, with silk metal framing the now-standard Classic Walnut Wood inlays. New ambient lighting from behind the console emphasizes the free-floating illusion. The 160-watt, eight-speaker sound system will play MP3 files and has an auxiliary input for iPods and other players. Sirius Satellite Radio is standard. A USB port is provided. Standard on the flagship T6 AWD Platinum is a five-channel, 12-speaker Dolby Pro Logic II surround-sound system developed with Dynaudio. Fuel economy for the base S80 with the 3.2-liter six-cylinder engine with front-wheel drive is an EPA-rated 18/27 mpg City/Highway. The turbocharged T6 is rated 16/24 miles per gallon. Maximum torque with the turbo is on tap from just 2100 rpm and remains available all the way up the rev range. At cruising speeds, we found the cabin quiet, with a bit of wind noise and a bit of tire noise coming in. The Dynamic chassis promises crisper response via shorter and firmer springs, modified shock damping, firmer anti-roll bars and stiffer subframe bushings. We experienced the adaptive cruise control system, which worked as advertised to maintain our preset distance to the car ahead in the fast lane, and we heard and saw the collision warning system in action and preferred to turn it off when on the crowded two-lane roads. We found the brakes powerful and quick and positive when used hard from high speeds. The Volvo S80 is a good choice among luxury sedans. It comes with Volvo's well-deserved reputation for safety engineering, so it's a very safe car. It has an understated grace. On the road, it's quick and powerful, surefooted and solid. The all-wheel-drive system that comes on the T6 enhances safety in slippery conditions. NewCarTestDrive.com correspondent Jim McCraw reported from Sweden, with Mitch McCullough reporting from Charlottesville, Virginia, and John F. Katz from south-central Pennsylvania. Head/hip/leg room, r: 38.3/54.7/35.0 in.